Welcome to the G-1. No, this was not an economic summit. We wine journalists are a spoiled lot. For the fifth Vinexpo in a row, I was invited to the prestige first-growth dinner of St Emilion. 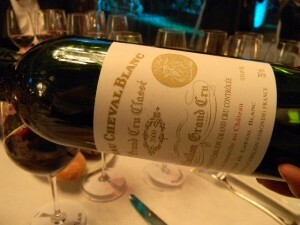 Organised by the G-1, the clever new name for the Groupement de Premiers Grands Crus Classés de Saint Emilion, the dinner featured some of the best that Bordeaux has to offer, from Cheval Blanc to Figeac, from Canon to Clos Fourtet. 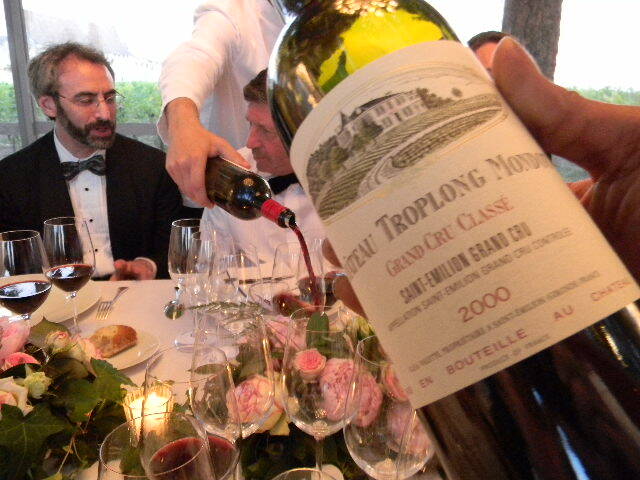 Since 1955, the St Emilion appellation has been classified according to four categories: St Emilion, St Emilion Grand Cru, St Emilion Grand Cru Classé and, finally, St Emilion Premier Grand Cru Classé. 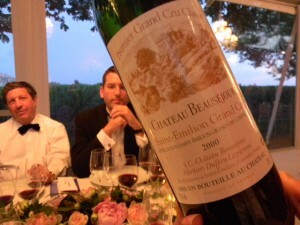 Unlike the Medoc and Sauternes classification of 1855 (see my notes from their official Vinexpo 2011 dinner at Chateau Haut Brion), this classification is revisited every 10 years, often leading to exciting and dynamic changes and sometimes … lawsuits, see here for example. For now, there are 15 chateaux classified as premier grands crus: Angelus, Ausone, Beausejour Becot, Beausejour Duffau Lagarrosse, Belair-Monange, Canon, Cheval Blanc, Clos Fourtet, Figeac, La Gaffeliere, Magdaleine, Pavie, Pavie Macquin, Troplong Mondot and Trottevieille. 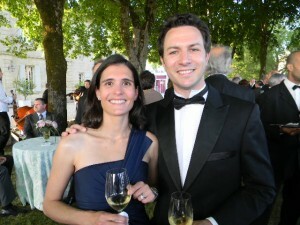 Does Pomerol have the best idea with no classification at all? But, then again, there would not be no G-1, and such a fine gathering. 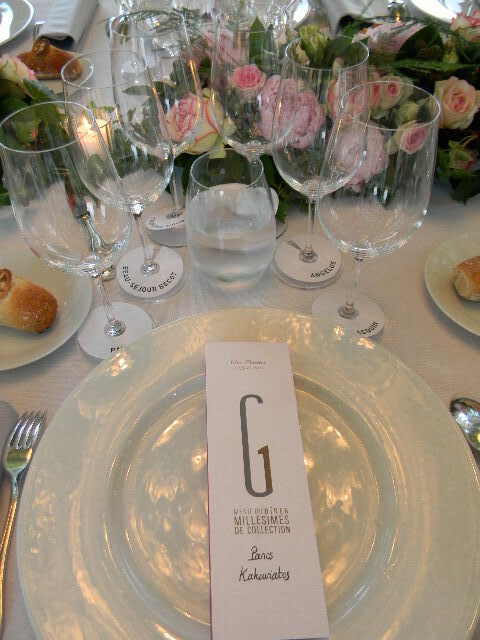 G-1 is a private organisation and would also include Ausone, if that chateau wished to join. 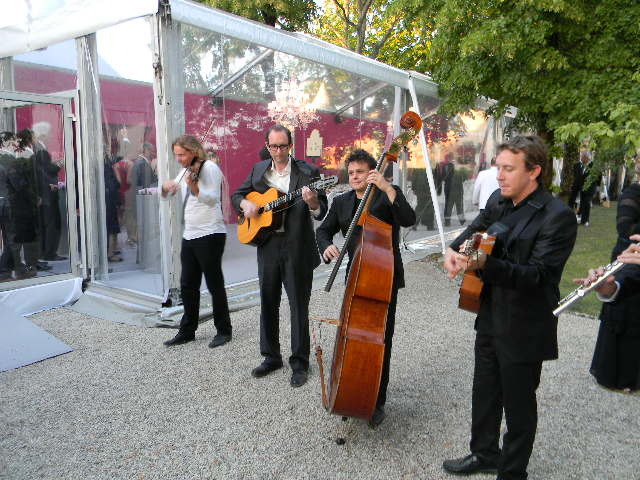 It organises promotional events for its members – I had even organised a blind tasting of the 2000 vintage for the Groupement back in 2005, see here: http www.wineint.com pavie underwhelms. 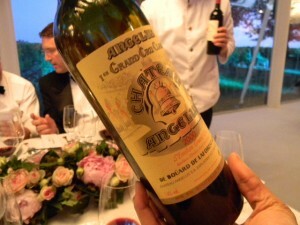 The dinner on 21 June featured excellent wines from all the members. 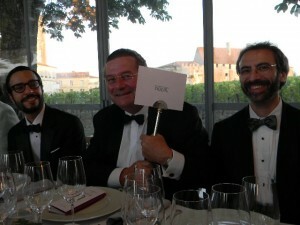 Indeed, these Vinexpo dinners have become legendary, as you can see in previous reports like this one. 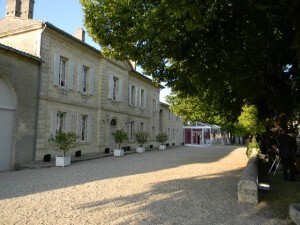 This year, it was held at Chateau Clos Fourtet, which enjoys the limestone plateau as its terroir. Its 20 hectares of vines average about 30 years of age. 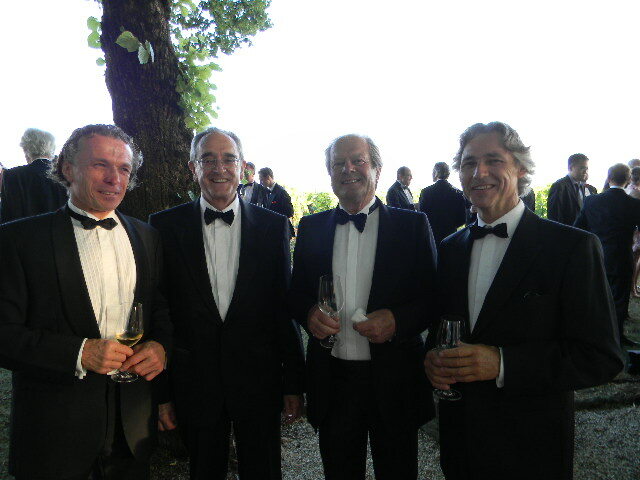 The Cuvelier family is a force to be reckoned with in Bordeaux, and they know how to make the best of this superb terroir, with not one, but two, exceptional consultants in Jean-Claude Berrouet and Stephane Derenoncourt. 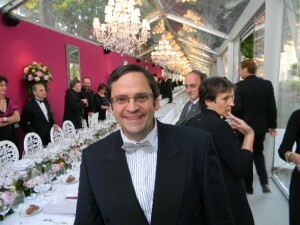 I had the pleasure of recently touring with Mathieu Cuvelier in Germany earlier this year, for two wine tasting dinners in Germany, see here and here, along with Chateau Leoville Poyferre, and it was great to taste some of the older vintages from this fine estate. My recent purchases include 2000, 2001, one of the best possible right bank 2003s and 2005. In any case, I do not know what lucky star fell upon me to deserve this honor, but here it came again, an invitation to the First Growth dinner, and I enjoyed it thoroughly. As the evening started, I met old acquaintances and made new ones, including Jamie Ritchie, president and CEO of Sotheby’s Wine in New York City. 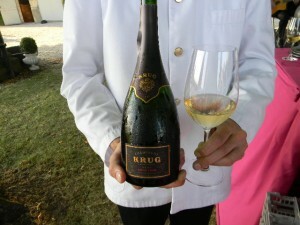 As usual a Champagne welcome, this year with Krug 1998, delectably rich yet precise. Once again one is reminded why Krug may be the king of Champagne, its vinous nature enchants with such depth of flavor and yet it remains elegant and refreshing, as any fine Champagne should. The dinner was prepared by three star Michelin chef Jean-Pierre Vigato, and it was delectable, particularly a highly imaginative mushroom serving and a savory meat dish. Guests sat along one of the longest tables I have ever seen, with places set up according to chateau. Long table: this is only half of it! I was seated with Eric d’Aramon and his wife Laure, of Chateau Figeac, one of my favorite wines from St Emilion. 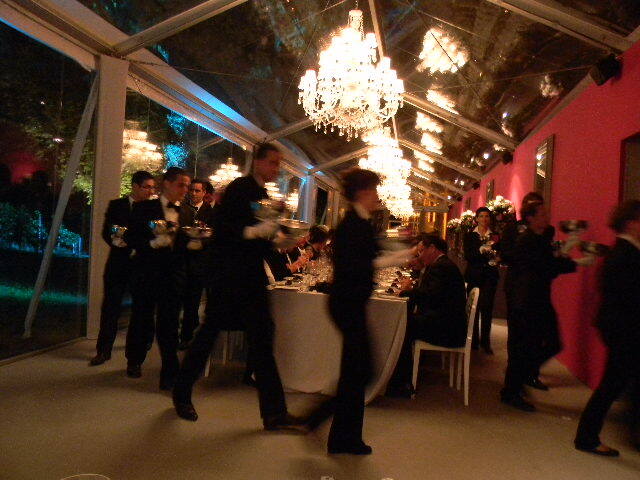 The dinner was prepared by three star Michelin chef Jean-Pierre Vigato, and it was delectable, particularly the mushroom medley and the meat. Wines ranged in style, one could say between more traditional and more modern. Interesting discussions ensued… Wine seller Jeffrey Davies champions the modern style and suggested that the Pavie Macquin 2000 – which I recall enjoying during the Heart’s Delight tasting in Washington D.C. with Robert Parker back in 2003 – was the wine that somehow bridged both styles. I did not agree, but it performed well for this dinner. Mark Golodetz, whose palate is more similar to mine, preferred Canon. Pavie 2002. This was pleasant, somewhat warm on the palate, but overall inoffensive. I did not get the oomph from riper vintages, and thought that this is actually a good thing. I enjoyed drinking this wine. Beausejour Becot 2000. During a blind tasting I had organised for G-1, back in June 2005, this wine obtained the most votes among the premier grands crus. As Joshua Greene of Wine and Spirit Magazine, who sat across from me, said, this felt more like a “real” wine: quite elegant, with some earthiness. Not incredibly complex, but certainly fine. I found more drinking pleasure here. Troplong Mondot 2000. At first, a closed nose. 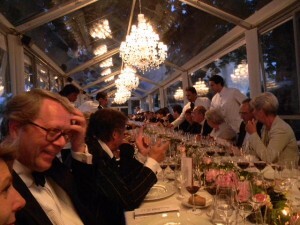 Apparently all the wines had been double decanted. 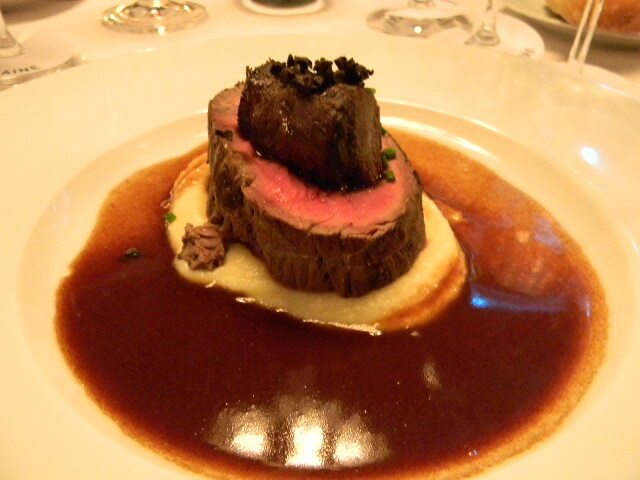 The palate was not really austere but exuded a sense of foreboding power. With time in glass, a likeable quality: not really sweet, but attractive… just enough for now. I think this wine has the quiet power and substance to develop into something grand in, say, five to seven years. I like this wine’s potential. But feel like it was a bit of infanticide. 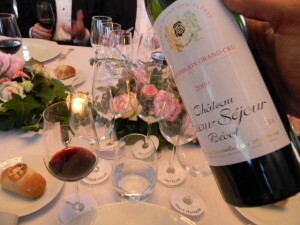 Beausejour Duffau Lagarrosse 2000. Mixed receptions here. Is there just a bit of underripeness, some questioned… I did not get that, as I liked the nose, overall. If not particularly complex, it was fine and fresh, if slightly muted. Interesting that back in 2005, the reaction was similar. Give it more time, it should become more interesting: a wine that needs time to age to come into its own, although it may lack the potential of the Troplong Mondot. Angelus 2000. A wine built to impress. I have had this many times since 2003, as I have organised tasting dinners with co-owner Jean-Bernard Grenié for luxury hotels in Germany and once for the Nantucket Wine Festival. The 2000 has a rich and powerful approach – on the nose and on the attack. Much blackberry fruit and the full body impresses, but the 1998 remains to me the more balanced wine, the wine with greater vivacity. But this is certainly an Angelus reference. 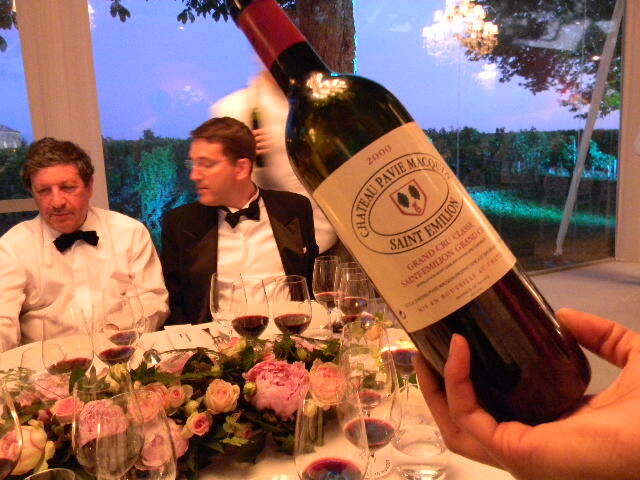 Pavie Macquin 2000. A sweeter nose. Very polished on the palate. Some oak derivation on the finish, but I can see why this would please many a palate. It did mine. 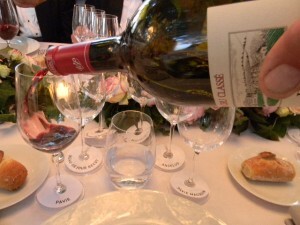 Its rich, savory palate made it a highly enjoyable wine on its own. Magdelaine 1995. Lo and behold. Land Ahoy! 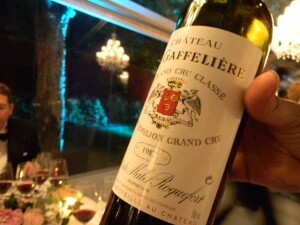 Here is the wine that perhaps pleased me most over this dinner. I asked for more. This was a wine to drink, a wine of pleasure, mixing appropriate acidity (not sharp in any way) with fine richness. Its fresh and just evolved enough flavors matched the mushroom ensemble perfectly: a “textbook St Emilion” that does not overwhelm you with oomph, but pleases you with subtle nuance. Clos Fourtet 1989 (magnum). A somewhat sweet nose (nougat, light chocolate) precedes this wine’s smooth attack, then a broad, somewhat warm, mouth-coating mid palate, ending with somewhat strict tannins. The wine is certainly tasty, but not quite as charming as the preceding wine. Canon 1985. 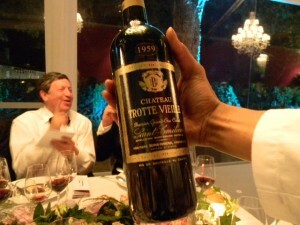 I recall having enjoyed this immensely with estate manager John Kolasa at the chateau in November 2007. I even guessed the vintage as we sipped it blind. This time around, I liked it almost as much. Certainly a fragrant nose with soft chocolate notes, the palate has energy conveyed in a fresh medium body, but, again, not quite as friendly as the Magdelaine on this evening. But a wine that is showing very well today. Interestingly, this was Jean-Claude Berrouet’s favorite at the dinner. La Gaffeliere 1982. 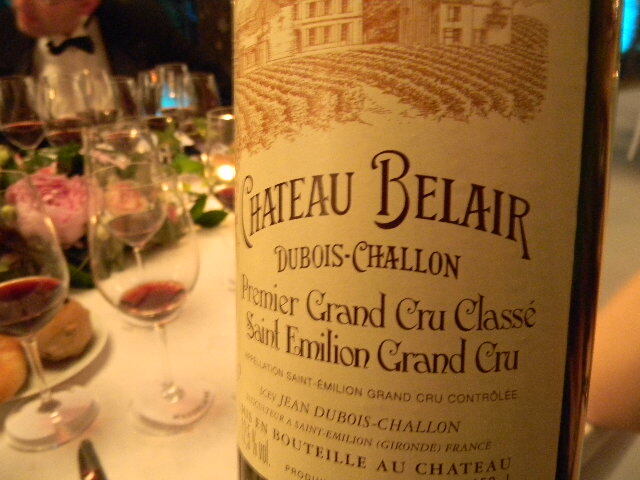 A pleasing nose, somewhat balsamic, preceded a fresh palate, with plum and hints of truffles and forest floor. Is it just a tad leafy? 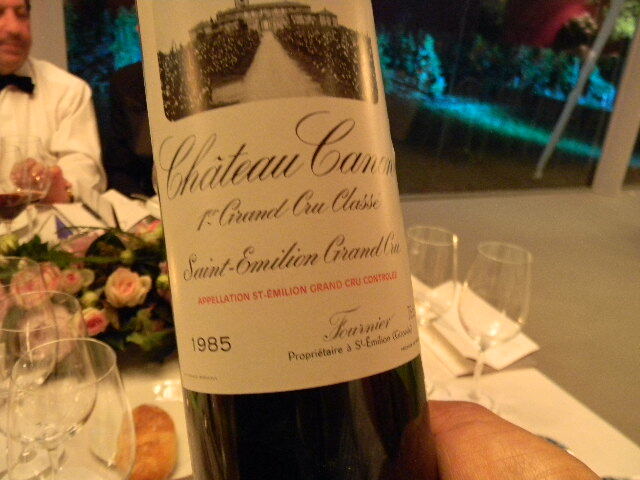 I liked it: a finely aged St Emilion, ready to enjoy today. Trottevieille 1959. This wine was too oxidized to really appreciate; we may have had just an off bottle. Belair 2000. Lovely nose of damson, chocolate. 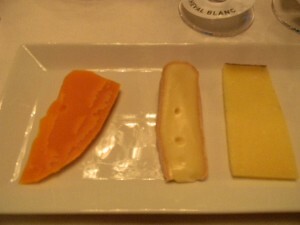 The palate was just slightly choppy, but exuded subtle flavors on the palate, if showing tannic edges on the finish. Fine overall, but needs more time in bottle. 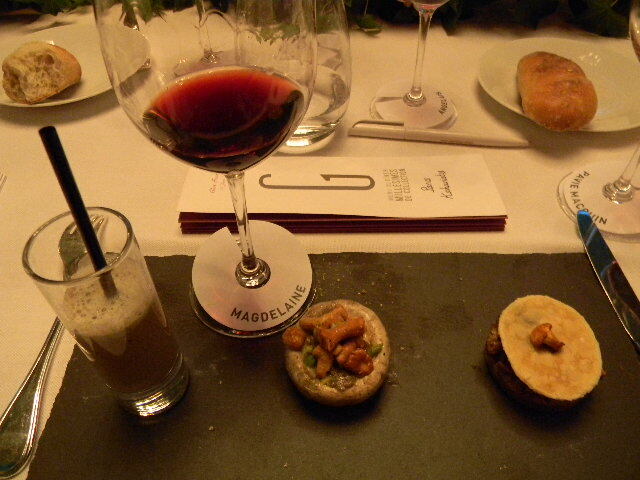 Kudos to the G-1, whose clever name is tops, for such a great gathering, with fine company, excellent food and excellent wine. Also highly recommended is a brand new book which profiles each member chateaux: L’Esprit des Vins, with lovely illustrations and informative texts.